Whether you are in business making candles or enjoy giving them as gifts, buying wholesale candle containers can save you money. Each of these styles is offered in several sizes. Many websites offer a choice of tops including smooth, designed or domed glass, meta, cork or wood. You can even find rusted metal tops for a really rustic look. 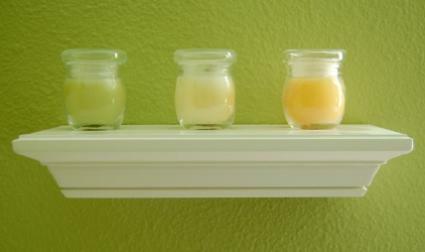 From bowls to geometric shapes and tumblers to votives, glass candle containers without covers are extremely popular. A cute candle container from Fillmore Container is a 16-ounce Mason drinking jar. There are also a wide variety of tops available that fit this mug. Metal tins make lovely candle containers. Although the basic shape is round, metal candle containers also are available in other shapes including square, rectangular and hexagonal. Sizes begin at two ounces and go up from there, and these tins should have a rolled edge. The Internet has many suppliers of wholesale candle containers.